Continuing on with the assignments from the CreativeLive class, 28 to Make. 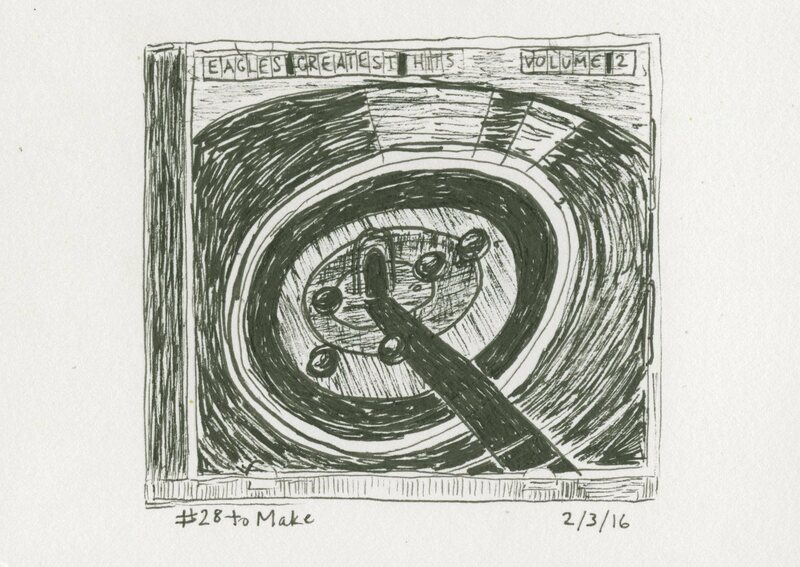 The project for Day 3 was to draw music cover art. I went to my CD collection, grabbed five, and chose the only one that didn't have just a photograph of the artist on the cover. 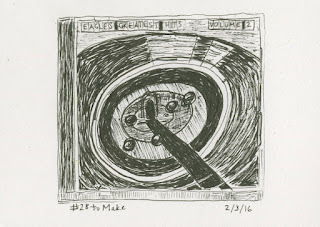 That one happened to be the Eagles Greatest Hits Volume 2. Great music, cool cover art, and somewhat of a bad choice for this assignment. The cover features large areas of solid black, which are very, very hard to create with a Micron 05 pen. The bold blue, red and yellow in the center were, obviously, impossible. I did my best, but it's rough. Still, not nearly as rough as a sketch of a person would have been, trust me. 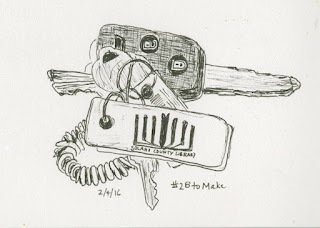 On Day 4, the challenge was to draw something from your purse or bag. I chose my keys. I think the fact I keep our very well-worn library cards on a key ring I have with me at all times says quite a bit about our family. 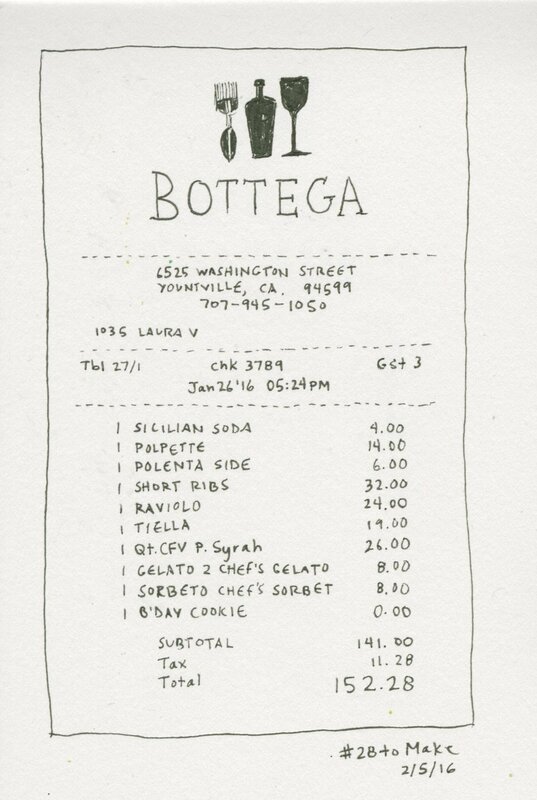 The assignment for Day 5 was to draw a receipt. 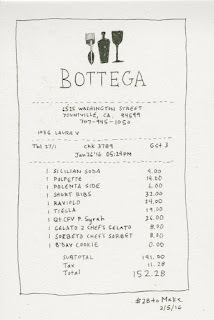 I chose to draw the receipt from Steve's 40th birthday dinner at Bottega. The meal, while expensive, was one of the best we've ever had... both because of the amazing food and something super cool and unexpected that happened. I'll blog about it once I finish the scrapbook layout about it, as it's #2 in my 40-4-Steve birthday project. The assignment on Day 6 was to observe the people around you, then select an adjective, noun, adverb and verb based on things you can see. It's not supposed to make sense and the items should not go together. 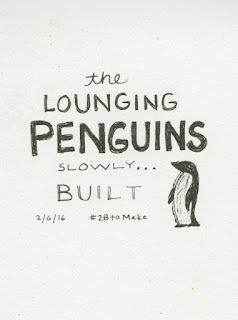 I observed Steve lounging on the couch with a good book, Trevor wearing penguin jammies, Trouble slowly stretching, and Trevor building with his K'nex. Day 7 was different. We were asked not to make anything, but rather to do a quiet reflection. We were given 10 questions to guide our reflection. 1. What makes you want to make? Everything makes me want to make. If I'm not actively making something, I'm thinking about making something and planning projects in my head. 2. Which project from this past week most closely addressed that core drive? I'd say Day 4, the one about drawing something from my bag. 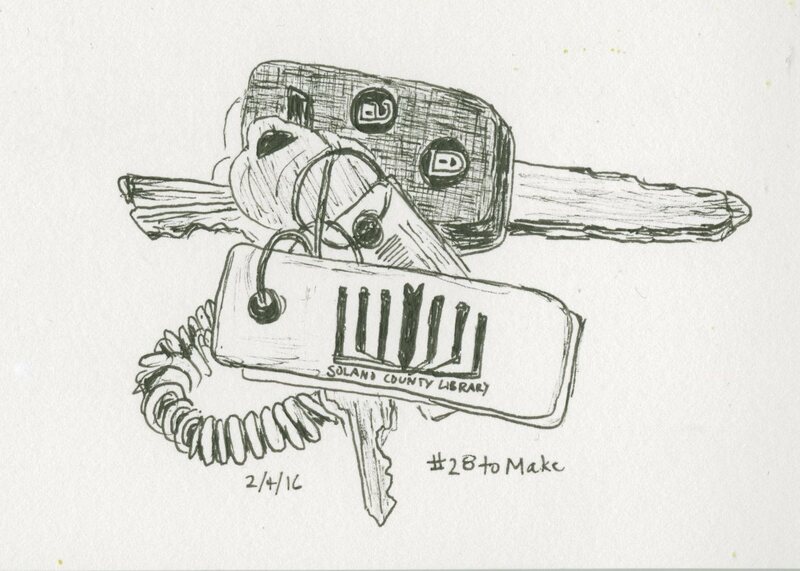 I really enjoyed sketching them, looking at the items on my keychain and thinking about why they're there. It was a challenging sketch, but I'm happy with how it turned out. 3. If you had an extra hour to focus on any one of this week’s projects, which one would you pick? Why? I think I'd try drawing some more album art. I don't feel like I set myself up for success by choosing the one I did. Now that I know that, I would look for an album that would work better with the fine-tip pen I'm using. 4. Was there a project this week that rubbed you the wrong way? If so, why do you think that was? I wasn't crazy about the adjective-noun-adverb-verb. 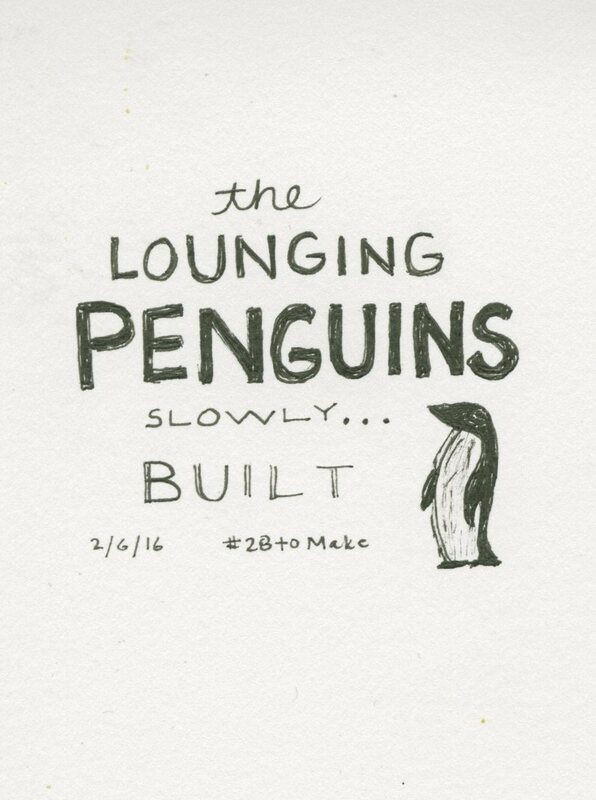 It didn't involve drawing (so I added a penguin) and it assumed we were able to do people-watching. 5. If you could ask any one historical figure to do any one of this week’s projects, who would you choose and which project would you have them do? This is a very strange question. I guess I'd like to see Ben Franklin's receipts. I have no idea why, other than that I recently read a book about Ben Franklin and he's a very interesting person. 6. What creative skill do you wish you were better at? 7. What’s one thing you can do from start-to-finish in the next 28 minutes to get just a teensy bit better? Write that down. 8. What creative skill do you think you’re best at? 9. What’s one thing you can do from start-to-finish in the next 28 minutes to demonstrate that? Write that down. I'm blogging right now. I'm counting that. 10. Did any friends, neighbors, or family members come to mind while you were working on any of this week’s projects? If so, write their name down. Yes, a bunch of people! The tea made me think of Steve, who has been so great about nicely encouraging me to hydrate, and my doctor, who wants what's best for me. The plant reminded me of my mom, an excellent gardener who would never rely on a drooping plant to know when to water. The Eagles CD made me think of my college dormmates. The keys reminded me of my friend Kristen, who works at the library, my former Glen Cove coworkers (because that's where the stretchy band came from) and my parents, since their house key is on my ring. The receipt made me think of Steve, Trevor, Michael Chiarello and our waitress, Laura. Steve, Trevor and Trouble inspired the penguin. LOVING the drawings and the Q&A!!!!!!!!!!!!!!!! Hi Cindy! I can't tell you how much I enjoyed this post! Your projects are wonderful. This class seems amazing! I like them all, but really love your album art and your keys!!! And your answers to the questions, too. Thanks for sharing this with all of us.